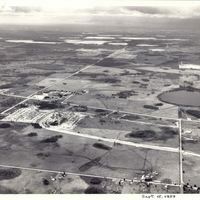 An aerial view from 1959, likely depicting the land that would be used to developed Sky Lake, Florida. The second photograph is annotated to identify the surrounded roads, including Lancaster Road, Oak Ridge Road, and U.S. Route 441 (US 441), also known as Orange Blossom Trail (OBT). Sky Lake is a residential community and unincorporated area in Orange County, Florida. It is located approximately seven miles south of Downtown Orlando between Lancaster Road and Sand Lake Road. The community was developed in late 1950s and 1960s by Hymen Lake. Houses originally sold in the range of $10,000 to $15,000. In the 1970s, Sky Lake became one of the first housing developments to be racially integrated. The community was originally proposed to include one thousand homes within the middle of the square mile block and a ring of commercial developments along the perimeter. Original 8 x 10 inch black and white photograph, September 15, 1959: Pine Castle Historical Society, Pine Castle, Florida. Digital reproduction of original 8 x 10 inch black and white photograph, September 15, 1959. Originally published by Dillon Aerial Photography. Copyright to this resource is held by Dillon Aerial Photography and is provided here by RICHES of Central Florida for educational purposes only. Dillon Aerial Photography. 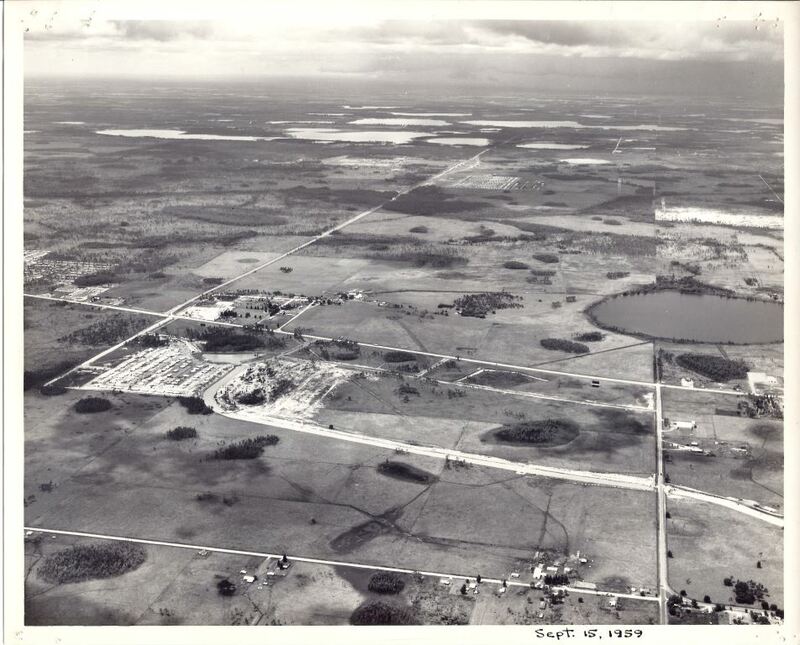 “Sky Lake, 1959.” RICHES of Central Florida accessed April 21, 2019, https://richesmi.cah.ucf.edu/omeka/items/show/7038.